About Golden Retriever Breeders... | Golden Retriever Savvy " "
Golden’s are a popular dog breed, so finding Golden Retriever breeders shouldn’t be a difficult task. That being said, not every breeder is trustworthy. Some breeders are only in it for the money. One of the worst places you could purchase a puppy is directly from a pet store. Why? The source where almost all pet stores receive their puppies are from puppy mills. What’s a puppy mill? It is an illegal large breeding operation that is involved in the mass production of puppies for profit. To make matters worse, the way dogs are treated at these mills is simply deplorable. Most of these puppy mills are filthy and are run by “breeders”, who don’t know the first thing about how to properly breed dogs in terms of their temperament, basic health, socialization, etc. Most of the dogs in puppy mills are constantly confined to small cages, are poorly fed, denied Vet care, and are left in a place that has no temperature control. When it all comes down to it, puppy mills, unlike reputable Golden Retriever breeders, do not care about the Golden breed, or any dog breed for that matter. They couldn’t care less if the pups are free of disease, or are bred for ideal temperament. 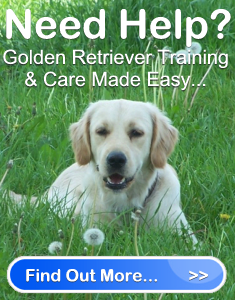 Good Golden Retriever breeders, on the other hand, care about preserving the dogs by keeping them healthy. Their goal is to weed out hereditary Golden illnesses such as hip and elbow dysplasia, heart disease and eye disease. Thus, a puppy mill has no qualms with interbreeding, over breeding dogs, sick dogs, or breeding aggressive dogs that have obvious temperament issues. The bottom line is puppy mill Goldens are bred for money, nothing else. What can you do? Don’t purchase puppies from pet stores, or from Golden Retriever breeders you don’t trust, or who can’t answer all of your questions directly. Don’t get suckered in by a puppy without first learning all the facts. You need to interview the person you are purchasing a dog from. It’s not worth it to let these despicable people pull the wool over your eyes, by making you oblivious to what’s really going on. Nothing would be more heartbreaking then bringing home a sick puppy that needs excessive vet care, has uncontrollable aggressive behaviors, or dies from an illness that simply can’t be treated. Do your part as a responsible dog owner and only purchase your dogs from legitimate Golden Retriever breeders, and spread the word about puppy mills. The more people aware, the less chance these horrible dog prisons have of surviving and hurting more dogs.